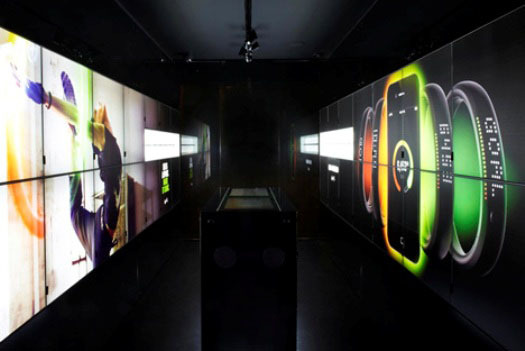 Nike has launched a series of interactive pop-up shops, which it calls Fuel Stations, over the past few weeks that bring together the brand’s tech and fitness offerings. We’ve seen plenty of great announcements, shiny new apps and innovative gadgets from Nike over the past year, most recently its basketball and training products, the Nike+ FuelBand and the integration of Path and Nike+. Now the brand has taken to the streets of London to showcase some of its latest products by opening up a unique pop-up shop at the BOXPARK mall in Shoreditch. The pop-up shop has been designed to link up with the brand’s new FuelBand, a device that tracks your movements, including the steps you’ve taken, the workouts you’ve completed and the calories you’ve managed to burn up throughout the day. The shop is obviously selling some Nike shoes and running gear too, but it’s full of lots of interesting tech, like a Kinect wall that tracks your movements, a running machine that tells assistants which shoes you need and iPads embedded on all of the walls to offer you an interactive catalogue and help you shop. If you’re looking to get your hands on one of the FuelBand gadgets, you can go into one of the Fuel Stations in May when they’ve been launched in order to set everything up properly and learn all about how it works. It’s great to see Nike’s regular products, new tech gadgets and cool retail concepts being merged into a very slick shopping concept that’s much more about getting you up and running then just getting you new stuff.